Hi friends! I hope you are doing well. We are having a bit of a struggle this weekend because everyone is a bit under the weather. But you know what? School is OUT so life is good, right? I used a Large Colored Tag in yellow and a Small Colored Tag in orange. I also used Raspberry Divine Twine and Teal Divine Twine. The patterned paper is Amy Tangerine Yes Please. I used a Studio Calico Wood Veneer Butterfly. And the stamps are from Fresh Squeezed Stamps Happy Hexagons. I'm also entering this into the Fresh Squeezed Stamps challenge #8 - summer. Be sure to check out THIS POST on the Whisker Graphics Blog to link up your creations and to check out what the rest of the design team did. Have a great day, friends! 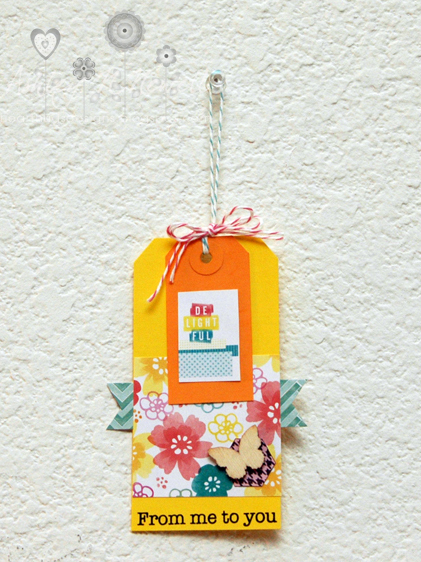 You know how much I love tags...super fun! thanks for joining in on the Squeeze-A-Palooza fun! great colors and a tag on a tag....brilliant! so sweet, Ashley.